A healthy diet for athletes has common-sense ground rules, followed by some tweaking to fit the discipline of choice for that particular athlete. For example, all athletes should go easy on alcohol, but a marathon runner may benefit from eating differently than the power lifter. That's pretty basic. Now, let's look at additional emphasis for endurance vs. explosive strength. Long distance runners, triathlon athletes and the like need sustained energy input for hours and hours. That means lots of slow-digesting carbs, such as whole wheat pasta, oatmeal, beans and rough bread. These foods come packed with fiber, which is another important factor in ensuring a long-term but steady energy supply. Some choose to sip fast-carb (sugar-rich) liquids or gels during exercise as well. More explosive athletes like sprinters, jumpers, lifters and tossers don't have to worry about prolonged energy. Instead, they need it all - right now! - meaning the conversion cycle of carbs to energy barely starts before the sprint or lift is over. 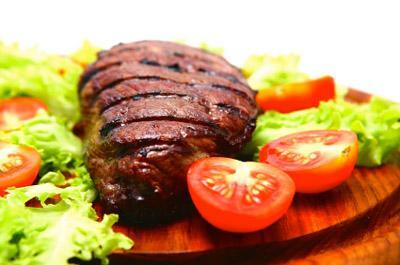 Hence, creatine-rich foods like red meat are a good idea, since it boosts the supply of "instant energy" found in the muscle (you can also buy creatine as a supplement). For training days, however, they can go for faster carbs, since this helps them refill the "instant energy" deposits between jumps or tosses. So, let's look at two sample menus, one for long-distance runner Ron and one for high jumper Jack. 8:00 - Breakfast Bran cereal, milk, orange juice, two slices fiber-rich bread, fistful of peanuts and/or sunflower seeds. 11:00 - Pre-run lunch Boiled potatoes, salmon, steamed vegetables. 16:30 - Post-exercise snack Protein drink with 50 grams of dextrose added, banana. 18:30 - Dinner Whole wheat pasta, skinless chicken breasts, steamed vegetables. 22:30 - Pre-bedtime snack Plain protein drink. 8:00 - Breakfast Oatmeal, low-fat milk, four scrambled eggs, orange juice, melon slice. 11:00 - Lunch Baked potato, large steak, onions and mushrooms. 18:30 - Dinner Sushi, vegetables. As you can see, the change is not drastic, but rather a slight tweak to fit their respective training style just right. Eat several smaller meals rather than two or three big meals only. Make the first two meals of the day the largest. Try to get some fruits, vegetables and nuts into every meal. Have something sugary immediately after your workout, since this helps the body start the recovery process sooner. Incorporate fish into your diet as often as possible, or take extra fish oil supplements. Beware of anything "instant" or that has an ingredient list that reads like something from a chemistry textbook.